The prophets were dedicated people of God who had a good historical memory of what God had done, an awareness of what God was doing, and a clear grasp of what God had promised to do in the future. The last three lessons, showed prophets as those who spoke primarily to the historical moment in which they lived. The message of Elijah and Elisha was directed against the Baalistic threat of Ahab's day. Amos and Hosea spoke to situations in Israel's age of gold. Isaiah, Nahum, Micah, and Jeremiah brought God's word to bear upon circumstances which prevailed in their own times. Yet they did not confine their message to the present. They also had a word for the future as predictors or foretellers. The Message - Sometimes the prophets predicted disheartening things. When the nation was morally sick, the prophets painted a bleak future for those who had put their confidence in the wrong things and offered no false comfort for those who cast their lot with evil. God's seers were alarmingly honest and declared that a sick society would be judged. But the prophets saw more than dark clouds in Israel's future. The Coming of a Messiah Out of David's Seed - Bright hopes belonging to Israel's future was first fashioned by Jacob. When the patriarch bestowed his blessings on the twelve tribes, it was Judah who received pre-eminence. When David, a Judean, was made king, it appeared to the chosen ones that the scepter had come to whom it belonged. God himself put a stamp on the permanency upon his reign when he said of David, "your throne shall be established forever." (2 Samuel 7:16) From that moment forward, any monarch ascending Israel's throne not a descendant of the Davidic line was considered an imposter by the house of Judah. When Judah itself was threatened with extinction by political enemies, it was the prophet who encouraged the Judeans to remember that the Davidic Kingdom would never end! The ember of hope for a messiah persisted through the Exile. Centuries passed, and Jesus of Nazareth stepped onto the scene. The hopes of the revisionists flared again. The Birth of the New Era - Although Jewish hopes centered upon the coming of God's annointed one, Israel looked for the birth of a new era! Not only would there be the establishment of a political kingdom ruled by the Messiah, but the very nature of life would be changed. Subjects of the Kingdom would be endowed with a NEW HEART and a NEW SPIRIT. A new covenant would be enacted. Peace and righteousness would prevail and the Lord himself would be king over all the earth. God's Kingdom on earth would not be a political kingdom like that of David's. God does not confine himself to an earthly temple located in a political state. The nations would be embraced in the new kingdom but only as God's instrument, the church, carries out its missionary work and brings the message of God to the world. Paradise Restored - As the people of God shuffled around in the burned-out ashes of a lost kingdom, the prophet reminded them that the future would be different. The bright light of God's morning would come again! Paradise would be Restored! There would be harmony with God. There would be harmony with others. There would be harmony with nature. The heirs of the kingdom would find that the dark night had passed. The Promises were for the Remnant - God's prophet did not imply that all the people would partake in the glories of the new era. Only a purified remnant would inherit the privileges and the responsibilities which were to come with the new age. The Suffering Servant - A major prophetic theme in the Old Testament which can refer to an individual, to the Hebrew nation as a whole, to the faithful remnant, or all three. Lesson 14 shows the prophets as those who spoke primarily to the historical moment in which they lived. The premise was established that one of the major functions of these heralds of God was to recall Israel to a realization of its destiny, "to be a blessing." The 17th study in the Bethel Series deals with a second role of the prophet, and that is of a foreteller. 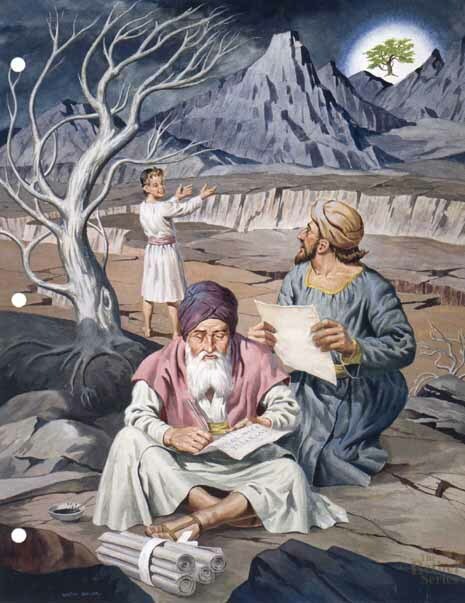 Figure in center foreground - The prophet. Withered tree and barren earth - Much of the prophetic message was born during periods of great crises in Israel's life. Young boy points to green tree on horizon - The prophet proclaimed bright hopes which belonged to Israel's future. The coming of a messiah out of David's seed. The birth of a new era. The exaltation of Mount Zion. The return of a remnant.